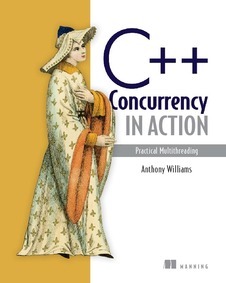 C++ Concurrency in Action is an excellent book. You should buy it if you want to use the support for concurrency added by the new C++ standard, C++11; and if you’re using C++11 you’ll deepen your understanding of the various language enhancements and how they work together. Who’s the author? What makes him qualified to write this book? It’s clear the experience of writing papers for the standards committee has paid off. The book is well organised and clearly written. Accurate and thorough, it’s also a pleasure to read. The examples are practical, and range from launching threads through to lock-free message queues. The largest case study — a message passing framework and an ATM application built on this framework — shows the expert use of modern C++ to write elegant and compact code. The clarity of the text is matched by the book’s clean and functional design. It looks good. I bought the dead-tree version which gave me free access to the ebook and I’ve made use of both formats. I’m new to C++11 and compilers are still catching up with the standard. This book is steeped in C++11. Reading through it, I came to realise that a close look at the standard thread library helps explain the evolution of the language as a whole: so that’s why variadic templates are needed, and move semantics work there, and — I get it! — lambda functions fit nicely with condition variables.